Founded by architect Drew Lang, the Faubourg St. Roch Project is dedicated to the full-scale revitalization of the city’s St. Rochelle neighborhood, which suffered extensive damage during Hurricane Katrina but had also endured decades of neglect. 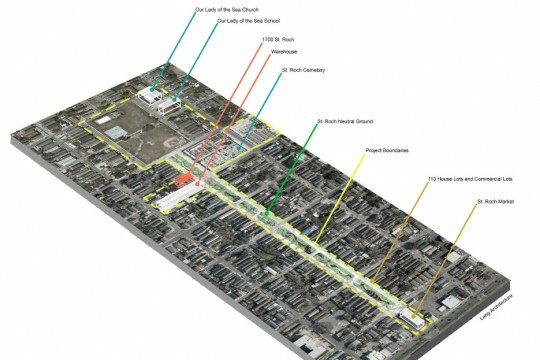 Since 2005 Lang has been studying, planning, acquiring permits, and working with the community to enact a plan that involves renovating damaged housing, invigorating public space, and reintroducing commercial and cultural ventures along a nine-block segment of St. Roch Avenue. Lang, who has offices in New York and New Orleans, recently completed thermal retrofits of seven homes and opened a community garden. He wants not only to create a sustainable, affordable neighborhood for residents, but to develop a model of community-based urban renewal for other neighborhoods to follow.